As a young child, when someone said something mean, we used to chant, “sticks and stones will break my bones, but words will never hurt me.” How wrong we were. Words can change everything—from our emotions and perceptions, to our actions. 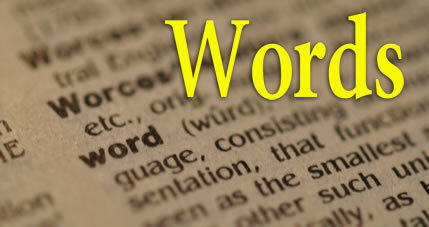 Word choice can help you communicate effectively, or not. I enjoy the subtleties of language. Words form pictures in our minds which associate meaning. One of our biggest challenges in communicating ideas is that these images and meanings can vary depending upon the person, their background, point-of-view, and experiences. For example, my wife and I have a very different perception of the word “camping.” To me, it represents adventure, fun, beautiful vistas, and friendship. But to my wife, it means dirt, discomfort, and unpleasantness. Notice: same word, two totally different pictures. If this kind of variation in meaning can occur with two people as like-minded as we, consider how different our word-perceptions could be when you add a different background or regional culture. So, we need to be careful how we use words and be precise in our communication. You might be thinking that’s a little over the top. Really? We often think of people as having “glass half full” (positive) or “glass half empty” (negative) personalities. More often, it is less about personality, than it is about the words that they use to communicate. Using the right words can change someone’s day. One of my mentors would constantly say, “don’t worry, it’ll work out!” These encouraging words gave me hope when things looked hopeless. Now, more than ever we need to fill the world with positive communication that can give people hope. The news media is notorious for using words that create negative emotions. No wonder newspaper sales are down all over the country. Case in point, I recently read a front page article in our local paper. The article stated that recent census information showed that our state was in the top 10 states for household income and the top 5 states for numbers of people with health insurance. It sounds like good news, right? But what did the headline say? “MANY RESIDENTS UNINSURED IN ’08,” and the subheadline? “STATE WAS 5TH LOWEST IN POVERTY.” Why not 5th highest in prosperity? Talk about looking for the bad news! Perhaps they feel that it is their job to ferret out the bad news. Unfortunately, too many of us feel the same. If we want any hope of achieving success, we need to look for the good news, and use positive words to express it. In the business world, we need to teach our people to avoid words that create fear, negativity, and worry—and to use words that create pictures that are positive, hopeful, and encouraging. This, I believe, is what won the last presidential election in the United States. President Obama constantly used words that painted a bright picture. When he spoke of the future, even when he was criticizing the former administration, his words created pictures which produced hope and encouragement. As a result, people believed him, and wanted to follow him. His words and his tone made the difference. Recently I had lunch with professional speech coach Patricia Fripp. My friend Patricia maintains that we use too many “fluff” words in our communication, words that are unclear or imprecise and can therefore give the wrong impression. One of these words is “stuff.” Patricia is on a mission to rid the world of this meaningless word, which to her connotes the image of miscellaneous garbage. I once made the mistake of referring to her CDs and DVDs as “her stuff” and got my hand slapped! She’s right, of course. If we pay attention to the words we use, it will make a big difference in our attitude and our ability to communicate effectively. This is so true. The slightest change in words/tone used can dramatically change any situation. If people would realize that just because something negative has happened to them or someone they care for, it does not mean everything in the world is negative and against them. No matter what the situation, there is good in everything!! I truly and honestly believe this. Yes in everything. Sometimes a car accident creates an opportunity for a doctor to be involved and find a life threatening illness to be prevented, sometimes a house fire gives a family a new opportunity for health due to their current home being full of mold, etc. If you continually look at/for negative, you will continually find it. If you take the stand … one door closes and another opens. You will continue to grow and enjoy the life that was given to you. Previous post: Yes, There Is A Short-Cut To Success!